With the conclusion of the promotion in collaboration with Mastercard, Baiduri Bank hosted a prize presentation today at the Kiarong Branch. Between 25 May 2018 to 25 August 2018, new and existing Baiduri Mastercard cardmembers stood a chance to win Royal Skies miles that can be redeemed for a pair of return air tickets to delightful destinations all over the world. During the promotion period, they simply needed to use their Baiduri Mastercard credit or debit cards when they shop both locally and globally. Every BND50 spent on the Baiduri Mastercard received one chance to qualify for the grand draw. 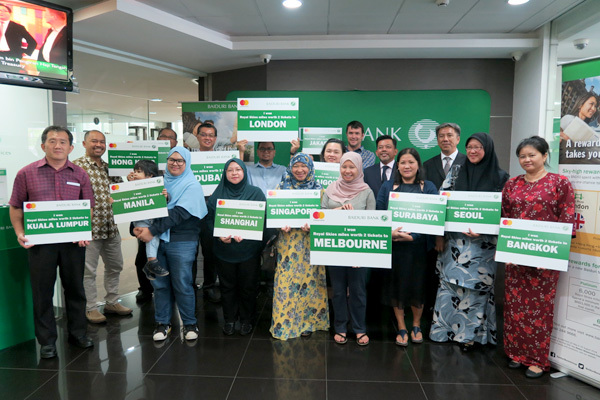 Additionally, second prize winner Nurul Rafidah Binti Mahmod won a trip to Melbourne, third prize winner Mr Lim Lee Shan won a trip to Dubai and other winners won tickets for two to Seoul, Hong Kong, Shanghai, Bangkok, Surabaya, Singapore, Manila, Jakarta, Bali, Saigon, Kuala Lumpur and Kota Kinabalu. Also present at the event was Lim Kian Chiong, Head of Card Business, Baiduri Bank. To be in the know of Baiduri Bank current promotions and events, the public can visit Baiduri Bank website at www.baiduri.com.bn under the Promotions section, or on the Baiduri Bank mobile app – Baiduri Deals, like the official Baiduri Bank Group Facebook page or follow @baiduribank on Instagram and Twitter. 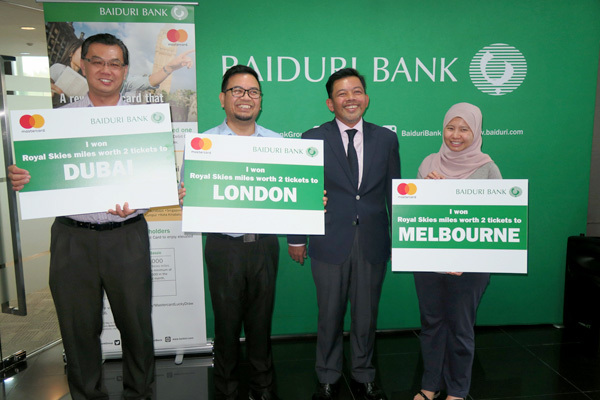 Baiduri Bank is one of the largest providers of payment products in Brunei, and holds franchise to four major card brands – Visa, MasterCard, American Express as well as UnionPay. On top of cashless convenience, Baiduri credit and debit cards come with an array of benefits, such as exclusive rewards and offers, easy instalment plans as well as ability to accumulate Bonus Points for the Baiduri Instant Rewards programme. For more information, customers may also contact the 24-hour Baiduri Bank Customer Helpline at 2449666, or enquire from the official Baiduri Bank Group Facebook page.